Arsenal superstar Pierre-Emerick Aubameyang turned in a disaster class for Gabon earlier today in their African Cup of Nations qualifier against minnows Burundi. With just moments left to play Gabon won a free-kick in a dangerous spot and it was their star who stepped up to the plate, rather than crossing the ball into his teammates – almost all of them were in the box – Aubameyang decided to fire a half-hearted attempt towards goal. Aubameyang made all that noise about whether he would play for Gabon or not only to drop a disasterclass when his country needed him the most. Stay in London. 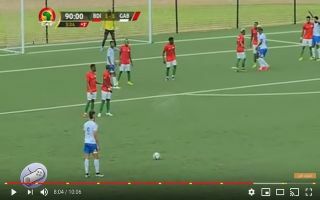 Burundi’s draw with Gabon will go down as a historical moment for the country, this is the first time that they’ve managed to qualify for the Africa Cup of Nations, it’s also the first time ever that the country has qualified for a major tournament.